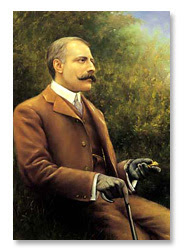 One of my favorite classical music pieces is Sir Edward Elgar's 'Enigma Variations'. This orchestral piece has 14 variations on an original theme. My favorite movement from that piece is the variation #9 known as the 'Nimrod Variation'. This short Adagio movement is one of the most beautiful melodies you will ever hear. This peaceful sound is perfect for this first day of November on this Sunday morning on the Tales classical music weekend. This video has Daniel Barenboim leading the Chicago Symphony Orchestra. Turn up the volume and enjoy the beauty of the 'Nimrod'.